Breaking News: Wise Men attacked by Trolls along the Information Highway. This entry was posted in American Art - post-election period, Dolls, Wee Folk, Wee Folk Players (they're a stitch) by Salley Mavor. Bookmark the permalink. 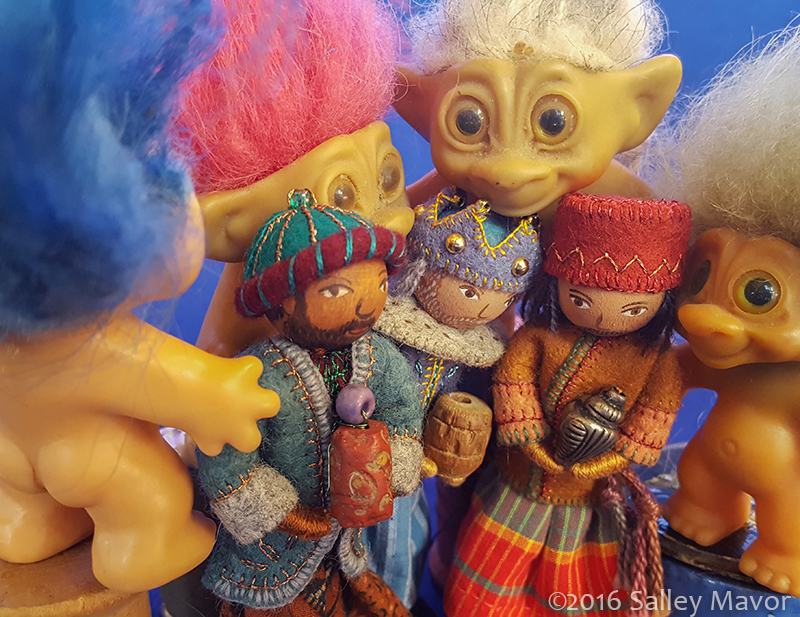 Appropriate…but these are far friendlier trolls than inhabit the internet. Well expressed, especially through art. Love this. Wonder if digital speech would be more civil if it were less anonymous. Love your sense of humor and your art. Your wonderful play with color always shines through , thanks for the giggle . What a hoot!!! Thank You so much. I’m impressed that you have troll dolls! The trolls on the internet are such small minded, irritating people. I rarely read the comments on article anymore because civil discourse has been lost. How will we ever come together when there’s hate and vindictiveness where there should be discussion? I LOVED my troll dolls-still have one with orange hair. I’m sorry troll has gotten such a bad connotation!